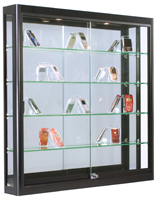 What makes display cabinets with locks a perfect choice for increasing merchandise security and loss prevention in stores and at events? 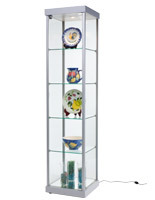 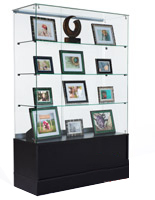 The security of knowing that valuable collections are protected from tampering, theft, damage, and even dust. 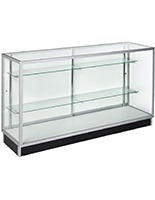 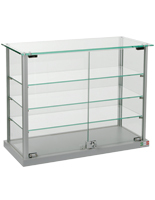 Our commercial grade display cabinets with locks are available in a wide variety of designs and configurations to match any business or organization's display needs. 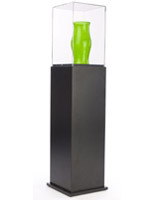 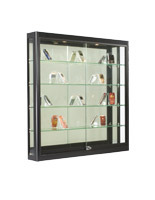 Our in-stock inventory includes specialty cabinetry for sports related trophies or memorabilia, retail merchandising fixtures for everything from high quality accessories and gifts to eyewear or collectibles, wall mounting curio cases, museum quality pedestals and furniture-style classic wooden hutches. 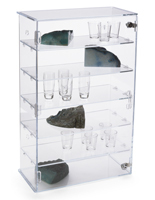 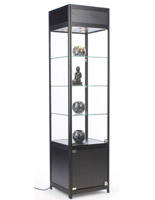 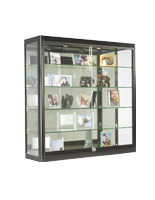 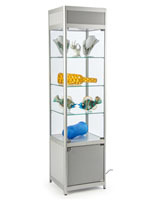 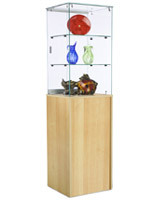 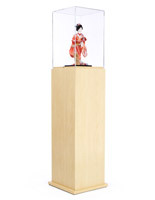 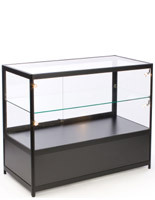 Each of our high quality display cabinets with locks, also known as locking display showcases, is designed to balance accessibility with security. 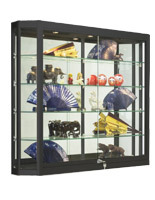 What differentiates the various locking merchandise and collectible case styles? 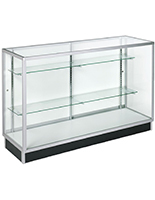 Display cabinets with locks on sliding access doors are ideal for retail merchandising displays in stores or at off-site trade shows or other promotional events. 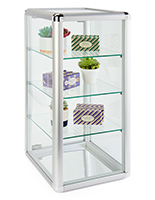 Tempered glass construction offers full visibility up to 360° for contents, while sturdy aluminum tracks allow easy movement as well as providing additional security. 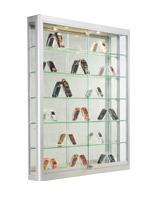 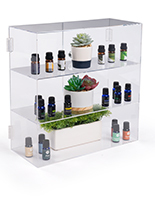 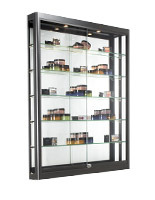 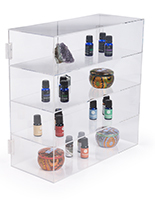 This type of locking display case is generally designed to allow entry to only one side at a time, making it a superior choice for commercial or sales environments and particularly effective on wall-mounted fixtures. 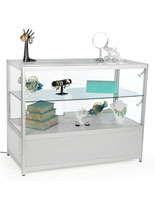 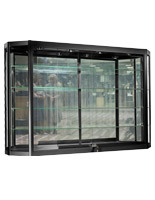 Lockable swing-open doors come in single and double configurations, generally based on the width of the showcase. 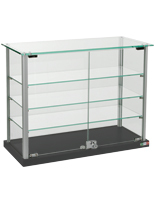 Offering complete access to the interior shelving, this style of commercial furniture is very well-suited to displaying valuable merchandise. 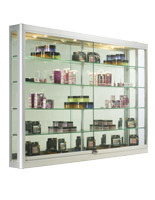 In addition, larger against-the-wall glass display cases in retail environments frequently feature swinging doors to allow staff to reach to the very back of each store fixture. 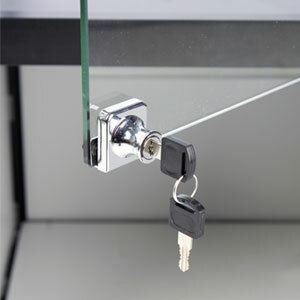 Lockable lids come in several configurations, from simple top-access lids with keylocks to museum-quality glass structures that attach to bases using security screws. 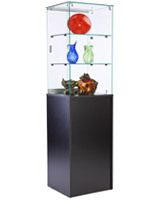 In addition, some styles offer full-vision pedestal-style tops that only allow access to contents through a sliding base panel. 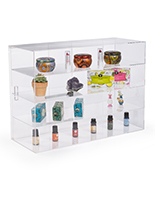 Locking storage can include everything from slide-in shelving to front, back or rear enclosures designed to hide contents from view. 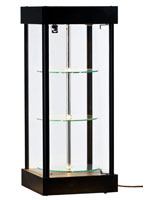 This type of security makes an ideal store fixture for businesses or facilities that wish to keep extra inventory on hand without having it be visible to customers, patrons or passers-by. 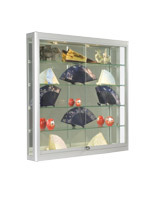 Portable showcases that break down or collapse for transport will also frequently incorporate lock mechanisms into the glass store fixture body as well as the transportation case. 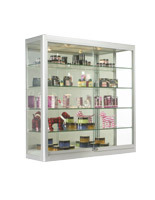 In addition to "standard" secure showcases, we offer a variety of dual access cabinets with locks that can feature any combination of top and bottom or front and back locking mechanisms, depending on the case design. 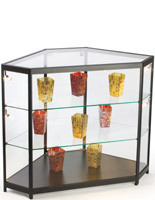 Perfect for retail or commercial environments, these store fixtures offer flexible accessibility options. 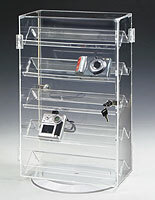 Specialty merchandising displays also require specialty security fixtures. 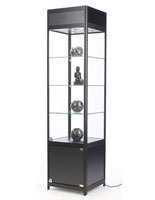 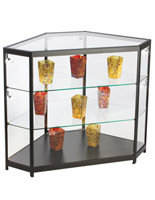 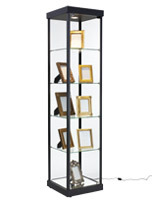 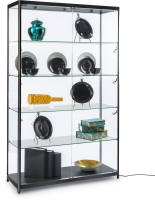 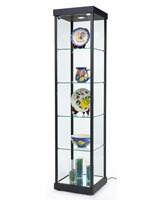 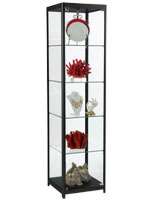 Furniture style curio cabinets, oddly-shaped memorabilia cases and other non-traditional showcase styles can incorporate locking mechanisms specifically designed for their functions. 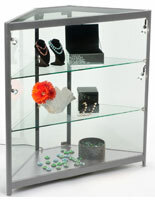 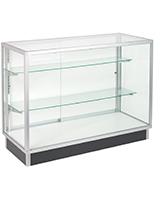 DisplayCabinets2go.com offers the widest variety of secured and non-security cabinetry for commercial and professional use. 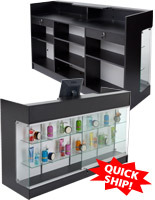 From store-ready Quickship models to lightweight, collapsible wheeled trade show displays, our massive inventory of in-stock fixtures is designed to meet the needs of stores, businesses, organizations, schools, clubs and more. 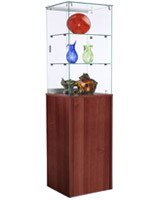 With 24-hour customer service access and easy 1-click ordering, our site offers the best selection of merchandise and collectible display furniture in North America.